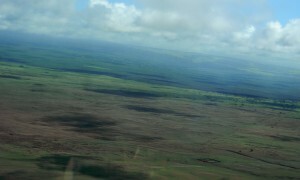 For nearly a year, I instructed and flew Part 135 air tours around the Big Island of Hawai’i. I left in July 2001 to return to the mainland to bury my sister, then moved back to San Diego. I visited the Big Island in late May, 2013, for a week long visit to show Laurel the place I lived, and to share the aloha of flying in paradise. Landing at Kona International Airport puts you in the mood for exploring a place where land is being created right below your feet. 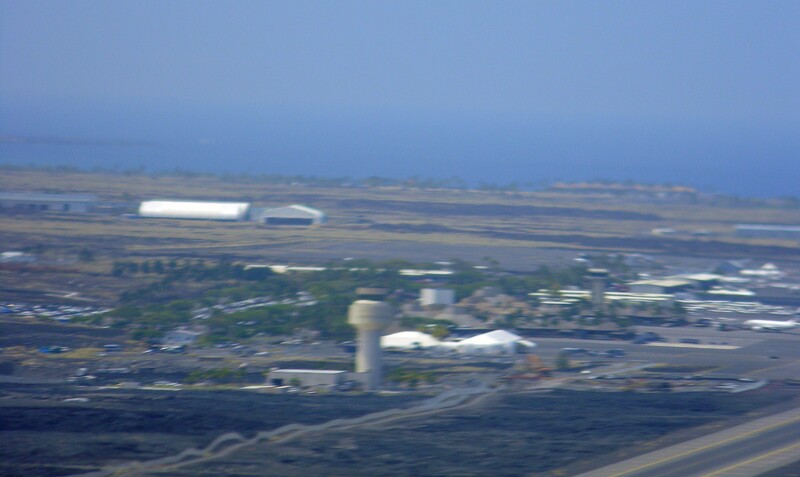 The airport sits atop a lava field and, if you land from the north, all you see from the window of your Hawai’ian 717 is ocean on your right, and lava fields on your left. It helps set the tone for your entire visit. I had contacted Mike Lauro of Tropicbird Flight Service about getting an insurance checkout so that Laurel and I could tour the Big Island. I had flown with Mike 13 years ago and liked him – and I was glad to be able to put a few $$ into his coffers. Even though I had flown there a dozen years ago, we did the full checkout before Mike would let me rent his 182 – and that’s as it should be. I had gotten quite familiar with the vagaries of flying in Hawai’i, but that was a dozen years ago and it takes a little practice and some local knowledge to again get comfortable with Hawai’ian skies … and … I was 12 years older and much longer in the tooth. Mike’s colleague, Terry Way, was my instructor. We checked my logbook, medical, certificates and ratings, then proceeded with the ground study and paperwork. We also chatted about colleagues and former colleagues with whom we’d flown. Aviation is a very small community and Hawai’ian aviation might well be its smallest branch – we knew many of the same flying folk and had a chuckle or two about our experiences. The aircraft checkout was pretty standard fare: steep turns, slow flight, power off and on stalls, a couple of engine out emergencies and, just to add some humility, a couple of landings at Waimea Airport, lying at 2671 feet in the saddle between the Kohala and Maua Kea volcanoes. The trade winds weren’t blowing too hard through the saddle, but the wind was still gusting to 25 kts from various headings favoring runway 4. I didn’t do too much damage to the airplane, so we returned to Kona and the sign off. The next morning, Laurel and I arrived at the airport hoping for a circle island trip. I had checked wx before leaving the hotel and radar showed rain showers approaching the volcano area in a series of pulses. Mike wasn’t too thrilled with the prospects of his airplane in the hands of a guy who hadn’t flown in Hawai’i for 12 years, and the prospect of venturing too close to the rain showers near the volcano, so we agreed to head south and stop short of the rain showers, then turn around for a trip back up past Kona and around the Hamakua coast on the northeast quarter of the island. It was a prudent plan – we were, after all, on vacation and I didn’t need to scud run around the volcano. We flew past Kona, Kealakekua Bay (where we had snorkeled on our first full day), Pu’uhonua o honaunau (the place of refuge), on to the southernmost point in the USA, Ka Lae. Not far from Ka Lae is an olivine cinder cone beach, which produces an olive green sand. (See above.) 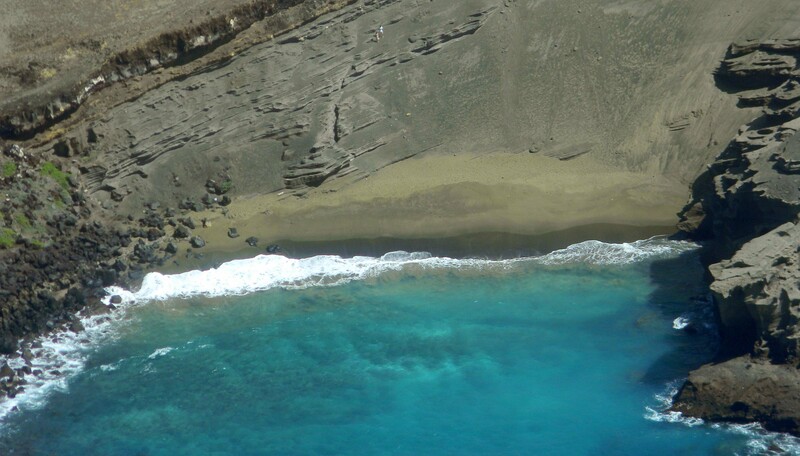 How many green sand beaches have you ever seen? 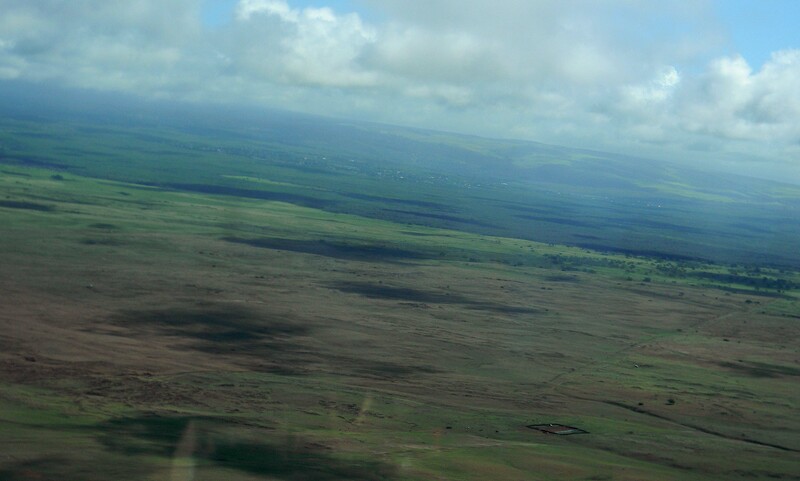 Heading back north, Laurel got a good look at the effects of the “rain shadow” from Maua Loa. The eastern half of the Big Island receives the full effect of the trade winds, which bring warm, moisture-rich air thousands of miles across an open ocean. When the trades hit the island, the air moves upslope, temperature and dewpoint meet, clouds form and thicken and produce rain. The western half of the island is sheltered by the volcanoes (Kohala, Mauna Kea, Hualalai, Mauna Loa and Kiluaea). Look below at a very graphic image of where it rains on the south coast of Hawai’i … and where it don’t. Kailua-Kona town is still the small, funky, fun place ’twas a dozen years ago. The population has climbed from 11,000 when I lived there to 17,000 or so today. The town lies along Kona Harbor in a crescent shape and is as much fun as Lahaina on Maui. but not quite as pricey. Lulu’s still sits across Ali’i Drive from the harbor, still sells a bunch of good beer, drinks and food. On the northern tip of the island, just west of Upolu Airport, lies the most brutal example of Hawai’ian culture, the Mo’okini Heiau. This place was a sacrificial temple, where human sacrifice was a regular occurrence. Every time I’ve been here, I’ve felt totally creeped out. 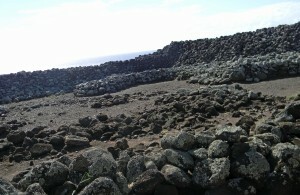 When you enter the heiau, the crumbling lava rock walls block the ever-present trade winds and deaden sound – the quiet is a palpable force. It is worth a visit and involves a rambling walk from the airport parking lot, or a very slow 4-wheel drive trip down a rutted, usually muddy, dirt track. 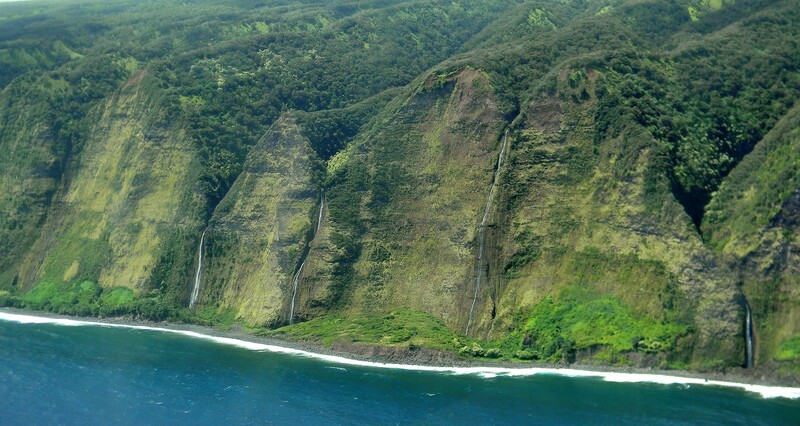 Rounding the northern tip of the island, you approach Pololu Valley, the northenmost of a half dozen valleys that drop from the heights of the eroding Kohala volcano. The valleys are spectacularly green and only truly viewed from the air. When it rains, as it often does on Kohala, the waterfall show along this Hamakua Coast is rivaled only by the Napali Coast of Kaua’i. The valleys stretch in a southeasterly direction, ending at Waipio Valley, home to taro farms and, perhaps, some guerilla gardeners. There are amazing hikes beginning at either valley and you can spend hours, or days, rambling along the Hamakua Coast. Spectaculah. 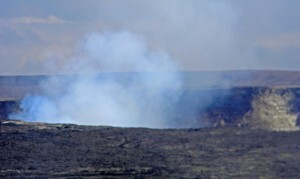 South of Hamakua lies Hilo, the capital, and farther south and east lies the active volcano, Kilauea. A trip to Hawai’i Volcanoes National Park may be one of the most amazing journeys you’ll ever make. When you walk past steam venting as rainwater hits the molten magma below, it’s a feeling hard to describe. Trekking across the face of a crater, like Kilauea Iki, is an unwordly experience. You descend from a rain forest into a barren landscape littered with fumaroles and lava, with steam venting around you and the knowledge that there is a lake of molten magma hundreds of feet below you. At the Jaggar Museum, just above Halema’uma’u Crater, you can learn more about volcanism than you ever imagined, and can study working seismographs that describe how bizzy the stuff below you really is. You can’t actually access the current vent, Pu’u O’o, from the park property. Renting a plane or taking an air tour is a great way to catch a glimpse of new land being formed while you watch. Hawai’i. There’s so much to the Big Island that a week really isn’t enough.